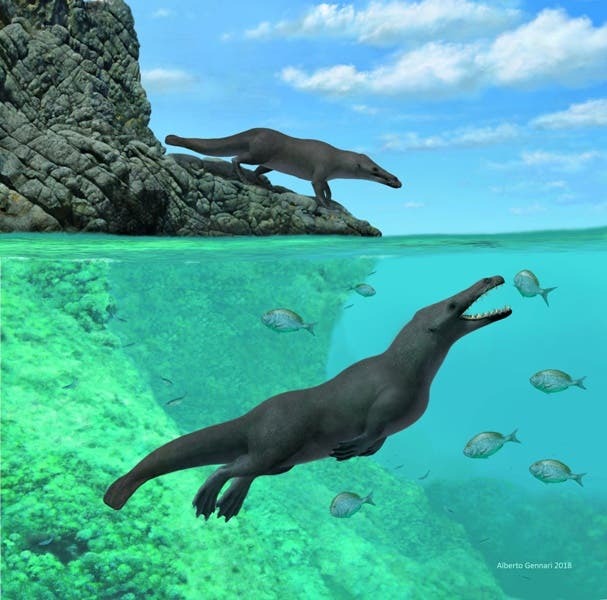 Its four limbs were capable of bearing its weight on land, meaning Peregocetus could return to the rocky coast to rest and perhaps give birth while spending much of its time at sea. Its feet and hands had small hooves and probably were webbed to aid in swimming. With long fingers and toes, and relatively slender limbs, moving around on land may not have been easy. Whale evolutionary origins were poorly understood until the 1990s when fossils of the earliest whales were found. Various fossils have shown that whales evolved a bit more than 50 million years ago in Pakistan and India from hoofed, land-dwelling mammals distantly related to hippos and about the size of a medium-sized dog. It took millions of years for them to spread around the world. Its presence in Peru, Lambert said, suggests quadrupedal whales spread from South Asia to North Africa, then crossed the South Atlantic to reach the New World.